At our site in Winterslag, we recently started working for a new pharma client, Fagron. For the next five years, H.Essers will be in charge of fine picking and fine packing the products of this pharmaceutical player that mainly delivers disinfectants, but also other medical supplies, to hospitals and distribution centres. “The fact that we can store and deliver both hazardous and non-hazardous goods offers great added value to this client,” says Benjamin Hermans, Business Unit Manager. “Over the past few months we have worked hard to align all the procedures. During workshops with the client, we worked out their needs, to subsequently transform these needs into processes for the organisation of our Warehouse Management System. More specifically, this entails that the products of Fagron or their suppliers are delivered to our warehouse in Winterslag. There, we check both quantity and quality. Subsequently, we stock the goods, both physically and in our Warehouse Management System. Once the goods are stocked, Fagron can send us their clients’ orders. These are then completely picked, packed and shipped by us. All these movements, both inbound and outbound, are linked to the client’s system". Besides fine picking, we have been focussing on the added value activities in pharma logistics for quite a while now. A fine example of this is the application of a unique serialisation number to the sales units. Given the fact that it concerns valuable pharmaceutical products, a specific GMP certification is necessary. Meanwhile, H.Essers has obtained several GMP licenses and helps more and more pharma clients to prepare the end products for the market. Currently, serialisation is a hot topic in pharma logistics. The new legislation (that aims to combat ‘falsified medicines’) not only leads to challenges for the pharma industry, it also offers opportunities! Want to know more? Read our expert paper! 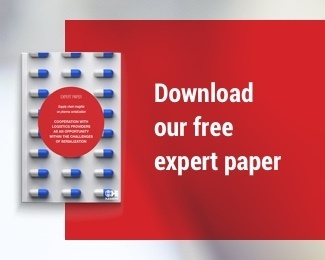 Download the expert paper about serialisation here. For more information you can contact Benjamin Hermans via benjamin.hermans@essers.com.